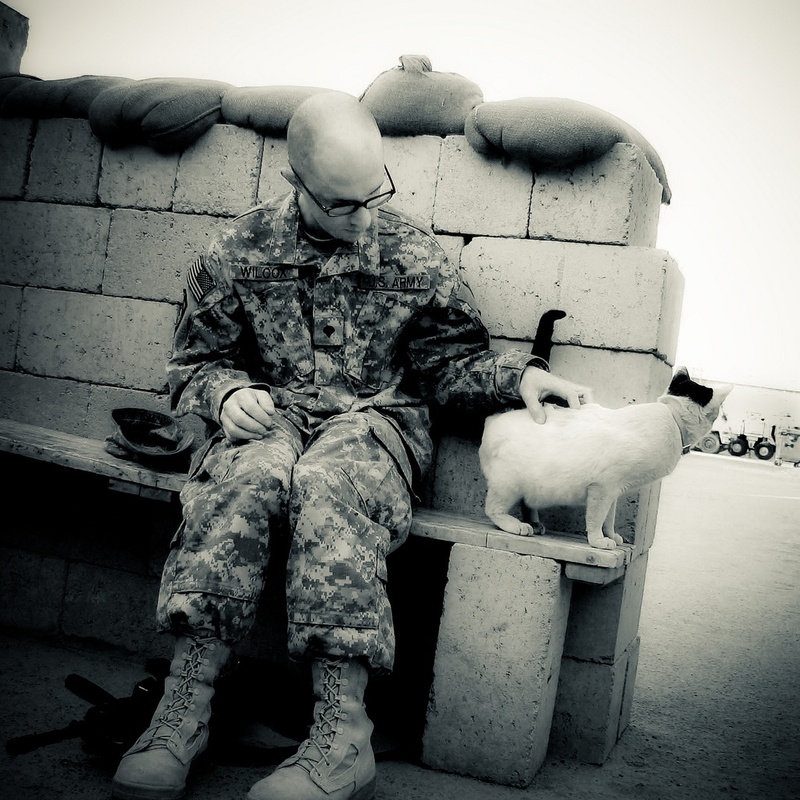 Tim Wilcox, was touched by this photo of his brother sharing a quiet moment with a cat during the Iraq war. Wilcox said, "Although I didn't actually take this photo myself, it's my favorite photo of my brother Tom in Iraq because he took time out to set down his weapon and pet a kitty." He put the photo up on Flickr, the photo sharing site, after he cropped it and did the black and white treatment in Adobe Lightroom. He said the "original was an ordinary snapshot. This person probably had no idea he captured something so beautiful." On this Memorial Day, thank you to the men and women who give and have given selflessly to their country. We love our heros, past, present and future. We will always remember them. Happy Memorial Day from over the pond and we think of all of those brave ones past , present and future , God Bless! Aww, what a lovely capture! Animals can bring comfort to soldiers and vice versa.Do you know about Bagdad Pups, the nonprofit that reunites soldiers from Afghanistan and Iraq with dogs and cats they have rescued? I've contributed to it - some very heartwarming stories! A day to remember and reflect. What a lovely image...a beautiful moment captured in time. Oh what a sweet photo! I hope both the soldier and the kitty are home safely. What a lovely picture. We, too, honor those who have so bravely served our country, and all of those who continue to do so.